Curtain Jerker, 1/21/13: The Punk Clock - WrestleCrap - The Very Worst of Pro Wrestling! Assuming CM Punk drops the WWE Championship to The Rock in six days at the Royal Rumble, his reign counter will expire at 434 days. Or, 1 year, 2 months, and 7 days, if you wish to be fancy about it. We as fans do ask for longer reigns, sometimes, so that the championship means more when the titleholder finally loses it. If it’s a secondary belt flipping waists every 4-7 weeks on Smackdown, we eventually become trained to not give a damn anymore about said championship. When Punk does drop the strap, after 434 days, will you, as a fan, feel his reign was worth it? Grant you, his matches were generally on the backburner behind Cena’s wacky feud du jour, and he went 8 straight PPVs without headlining at one point. Rarely was Punk, until the heel turn, treated as the star of the show. On the other hand, he decisively beat the likes of Ziggler, Jericho, and Bryan during his feud, and remained a much sought-after star in the eyes of many fans. The question is: do you view CM Punk’s reign, lengthy but not dignified by the company’s hand, as a successful one? 7 Responses to "Curtain Jerker, 1/21/13: The Punk Clock"
I like Punk, I like that he has had A long title reighn and its pretty cool everytime they acknwledge when he breaks A past stars record, that gives it A legit sport quality to it!, but I think if he drops it to the Rock and becomes Taker’s next Mania victim than that reighn is just gonna be meaningless, and other than if he wants to start A talk show like the Miz I wouldnt see them having any big plans for him after that! I think Punk’s reign will be remembered as a successful one. Sure, he may not have been the headliner every single time, but the length of time he held the belt, plus the facts that he had some fantastic matches along the way, & there’s still people chanting his name, makes the reign a success in my book. Punk’s title reign has been successful, and it has given us some outstanding matches. He has proved that he can carry anyone. Even if he does end up losing to the Rock at the Rumble PPV, overall he will still come out looking good. As of now, it is a very successful title reign. It has brought back validity to their top title and meaning to the championship matches. Ultimately though, it has to be dropped to someone worthy of ending such a monumental reign…and that can realistically only be The Rock. No other performer in the WWE has the same following as The Rock nor connection with the fans. As exciting as a streak vs streak match at Mania with Taker would be, sadly as a performer, he is at the end of the road of his career & WWE needs to pass the belt onto a performer who, like punk, can carry the company. Enter John Cena. 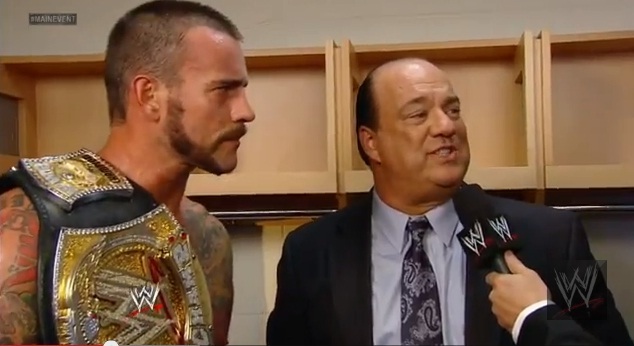 Now let me be clear, Cena can’t take the belt off Punk. He is far too polarising to the audience to go in as a top baby face & deliver what we should expect. The whiney, cheating heel finally getting his comeuppance, that’s The Rock’s job, but afterwards it makes perfect sense to have Cena-Rock II for the belt. Rocky has made it clear to all in the know that come April it’s back to Hollywood. He won last year against Cena, causing Cena to thankfully take time out of the title scene, and that was a big draw for the WWE. To do the same again makes perfect sense & to include the championship will not only give the rub to Cena but continue to book how important the title is in the WWE by doing the job at Mania. Cena is reaching the end of his career, he realistically only has one good title run left in him, but love him or hate him he can carry the belt like Punk & raise interest and promise in the new & upcoming heels. Just like Punk has raised interest in new babyfaces. That’s my elongated two cents on not just Punk’s reign but the Road to Wrestlemania. A really interesting and entertaining turn of events would be for Rock to beat Punk at the Rumble and for Punk to snap Taker’s streak at Wrestlemania in an epic match for the ages. This being the WWE, I wouldnt bet on it. Punk has had great matches with Bryan, and my favorite; Jericho, and in storylines brought back David Koresh, er, I mean Paul Heyman. As far as I’m concerned, that’s enough to erase the crap that has happened during his reign. punk also has history on his side. He not only is the longest reining champ in more then five years but he is the first person since hulk hogan back in 1987 to hold the championship on januray 1st for one year and remain the champion still on january 1st one year later.